Dan Gurney was joined by fellow American racing icon A.J. Foyt in winning at Le Mans in 1967. Gurney passed away on Sunday. Gurney _ who won races in NASCAR stock cars, Indy cars, Formula One cars and IMSA sports cars _ died Sunday from complications of pneumonia at age 86 in Newport Beach, Calif. Gurney was born on April 13, 1931 in Port Jefferson, N.Y.
Gurney won races at Daytona, Sebring, Le Mans and other top European circuits. He is one of only three drivers to win races in NASCAR Cup, Indy car, Formula One and elite sports car competition, along with Mario Andretti and Juan Pablo Montoya. 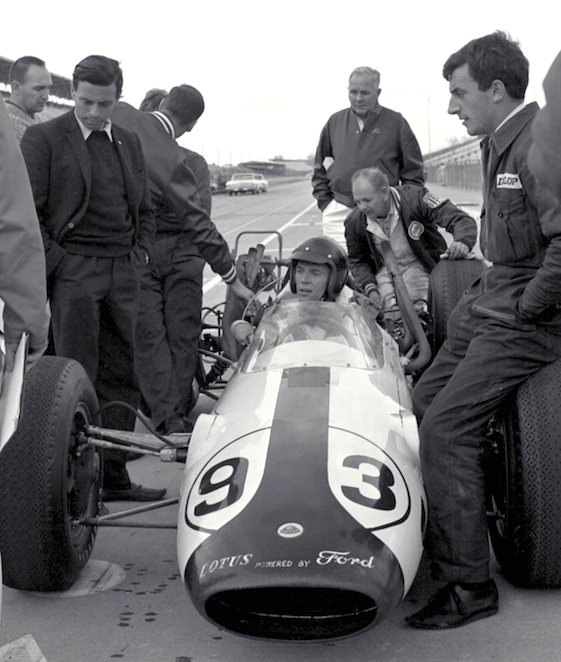 Gurney drove for a handful of international marques, including Ford, Porsche, BRM and Brabham. Dan Gurney and A.J. 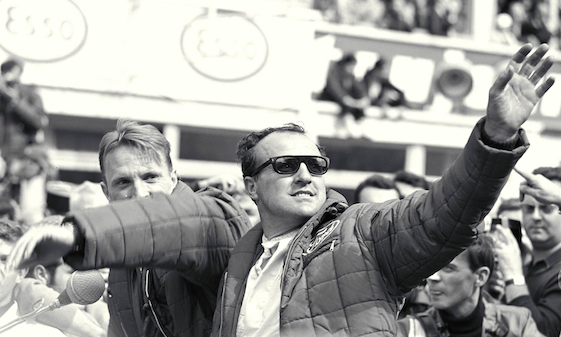 Foyt made history in Le Mans in 1967.
the word ‘legend’ but in the case of Dan, he was a true legend of our sport. We became close friends at Le Mans in ’67 and winning it brought us closer together. He was a super guy. Even though we were competitors in the Indy cars, we always respected each other highly. Gurney’s prominent peers included Americans Foyt, Andretti , Parnelli Jones and Roger Penske, as well as international grand prix stars Sir Jack Brabham, Jim Clark, Graham Hill and Sir Jackie Stewart. “The word ‘legend’ can sometimes be overused, but in describing Daniel Sexton Gurney, it’s the only word that fits,” IMSA President Scott Atherton said. “Dan Gurney was an American racing legend who accomplished nearly all there was to accomplish as a driver in our sport, from sports cars to NASCAR, Indy cars to Formula One. Dan was an innovative car-builder and a lifelong steward of motorsports beyond his on-track performance. “In the world of IMSA, he was a championship-winning team-owner with his All-American Racers, and in later years, his son, Alex, would become a driving champion as well in the GRAND-AM Rolex Sports Car Series. Alex Gurney teamed with Jon Fogarty to give GAINSCO/Bob Stallings Racing its GRAND-AM Rolex Daytona Prototype championships in 2007 and 2009. Dallas businessman/racer Stallings often has referred to Alex as a son, while establishing a friendship with the elder Gurney. Gurney raced in Europe during the late 1950s and 1960s at a time when the American public was generally not following European racing anywhere close to now. Gurney enjoyed considerable success overseas, including winning four Formula One World Championship Grand Prix events, sharing the winning car in ‘67 at Le Mans with Texan Foyt, plus the 1960 Nurburgring 1000-kilometers with Stirling Moss. Back in America, Gurney claimed seven United States Auto Club-sanctioned National Championship events in the late 1960s; five-of-six grueling 500-mile NASCAR stock car races held over the Riverside, Calif., road-course between 1963 and 1968; numerous events in the SCCA Can-Am and Trans-Am series and even the first professional road-racing series conducted in the United States, the inaugural USAC Road Racing Championship in 1958. Gurney earned his first Formula One victory in the French Grand Prix in 1962. 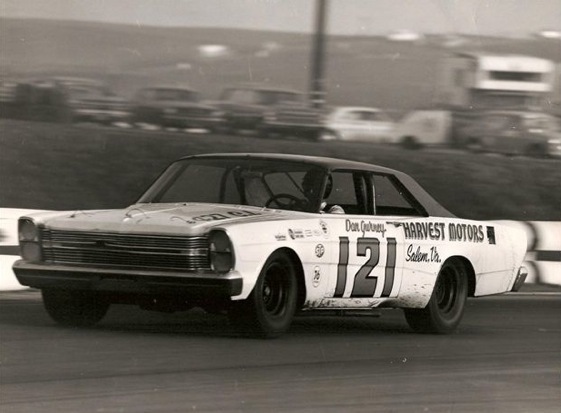 The following year he began a streak of four consecutive wins in the NASCAR road-course race at Riverside, driving for Holman-Moody (1963) and the Wood Brothers (1964-66). In 1967, he captured his first Indy car event at Riverside before winning his fifth and final NASCAR race on the same circuit in 1968.
different drivers in the car, I could tell you which one was Dan. He would always take the right approach to the turn, and I can’t say enough about how good he was. We had so much fun with him. If you got the car equal to anybody else, you were just home-free. Gurney drove in nine consecutive Indianapolis 500s between 1962 and 1970 _ finishing second, second and third in the final three _ and was the winning manufacturer three times. Bobby Unser drove an Eagle chassis constructed by his All-American Racers company in Santa Ana, Calif., to victory twice (for Leader Cards, Inc., in 1968 and for Gurney’s team in 1975), and Gordon Johncock won in an Eagle for the Patrick Racing Team in 1973. Of Gurney’s numerous accomplishments, undoubtedly the most renowned took place during an incredible eight-day period in 1967. On the weekend of June 10 and 11, he shared the winning Ford GT40 Mk IV with Foyt in the 24 Hours of Le Mans, the world’s premier endurance sports car race. Having broken Enzo Ferrari’s stranglehold on the event in 1966 with co-drivers Bruce McLaren and Chris Amon in the Ford GT40, Ford entered a seven-car armada in ’67. Included were four 427 cubic-inch V8 Mk IVs shared by a world-class roster of drivers _ Gurney, Foyt, McLaren, Andretti, Mark Donohue, Lloyd Ruby, Denny Hulme and Lucien Bianchi. Foyt, who had won his third Indy 500 two weekends before in his No. 14 Coyote, never tested and had logged few practice laps in the red No. 1 Ford. 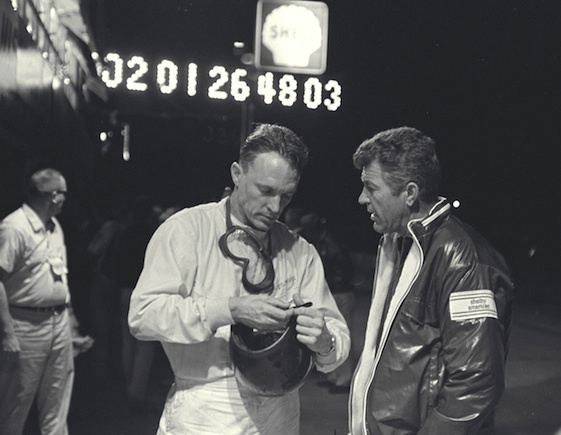 Despite all that, he and Gurney and the car entered by Shelby American led an incredible 22.5 of the 24 hours, or just under 94 percent of the distance. They completed 388 laps/3,251.57 miles around the 8.365-mile circuit at a record average speed of 134.865 mph. 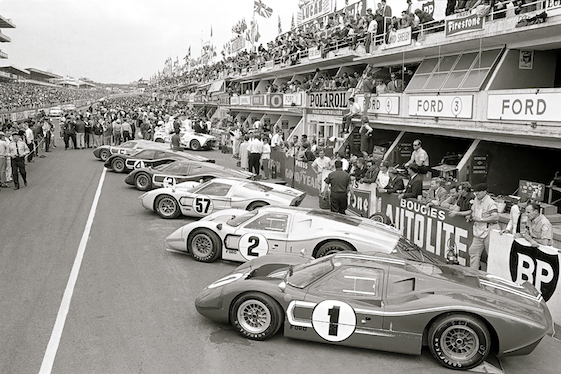 Foyt returned to Le Mans last June for the first time since that victory 50 years ago. 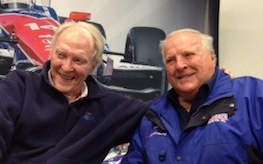 In an interview with RacinToday.com at Texas Motor Speedway in Fort Worth during the annual INDYCAR weekend, Foyt sadly noted that Gurney was too sick to make the trip back to France. Asked how many hours he had logged behind the wheel that weekend in ‘67, Foyt said, “I think it was about 14-and-a-half hours or so. They couldn’t find Gurney on one of the (pit) stops. They were looking for him and he wasn’t where he was supposed to be and he said he was…and that was a shift around from 2 (a.m.)…we was running four-hour shifts. And my arms were hurting so bad because Gurney (at 6-foot-3) was so much bigger than I was (at 5-foot-10) and we didn’t have adjustable seats in there. On the very next Sunday, Gurney won the Belgian Grand Prix over the blindingly fast Spa-Francorchamps circuit, driving a Gurney Weslake-powered All-American Racers Eagle for which he was manufacturer and team principal. This remains the only occasion when an American driver won a points-paying Formula One World Championship Grand Prix at the wheel of an American car. Jimmy Murphy’s victory with a Duesenberg in the 1921 French Grand Prix took place almost 30 years before there was a World Championship for drivers. 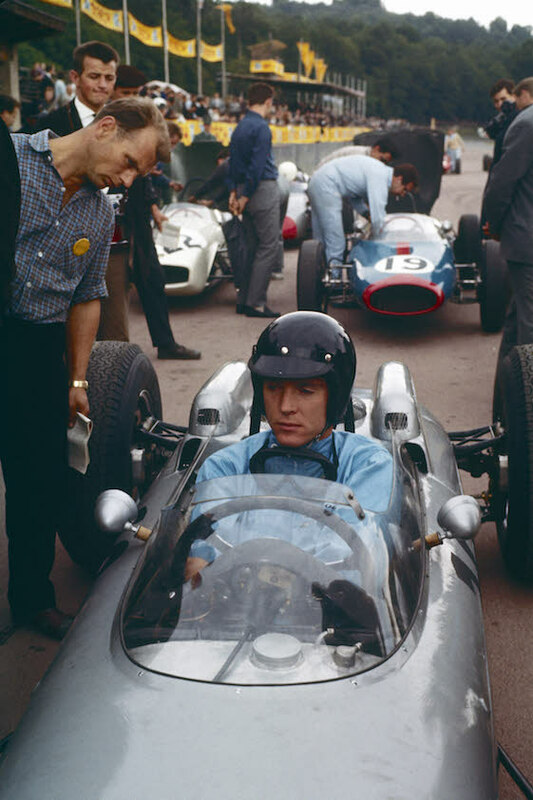 Dan Gurney piloted the Porsche 804 Formula 1 car in 1962.
and then to Porsche, for whom he won the 1962 French Grand Prix at Rouen in an eight-cylinder Porsche Type 804. That remains Porsche’s only success as a vehicle manufacturer in the Formula One World Championship. Porsche also helped him to find lifelong happiness in his private life in the 1960s, when he married Evi, a former German motorsports journalist and secretary to Porsche Racing Manager Huschke von Hanstein. In addition to his success with Porsche, Gurney also won both the French Grand Prix and Mexican Grand Prix for Brabham’s team in 1964. By this time, Gurney already unintentionally had played a major role in changing the face of racing at Indianapolis Motor Speedway. Despite being an enthusiastic spectator at East Coast Midget car racing events during his teen years, Gurney never had visited IMS before he went there as an entered driver in 1962. He was scheduled to drive a rear-engine turbine for John Zink but ultimately qualified a rear-engine Buick-powered car for Mickey Thompson after taking his “rookie” test, incidentally, in one of Zink’s Offenhauser-powered front-engine Roadsters _ a historical footnote about which Gurney was extremely proud. Driving in the 500 while also competing on the Grand Prix circuit in those days required quite a bit of trans-Atlantic travel during May. After qualifying for the 1962 Indy 500, but well before the race itself, Gurney flew to Zandvoort for the Dutch Grand Prix on May 20. He had plenty to think about. Although rear-engine cars had been entered for the 500 between 1937 and 1951, they had enjoyed virtually no success. But after then two-time/reigning World Driving Champion Brabham came to Indy the year before (1961) and drove an underpowered rear-engine grand prix Cooper-Climax to ninth, Gurney began to contemplate the potential of the lightweight rear-engine cars that were dominating F1. Arriving in Holland, Gurney began trying to convince Englishman Colin Chapman of Team Lotus that he should go to Indianapolis. Chapman reluctantly agreed, but only after Gurney offered to pay his passage. Once at the Speedway, Chapman began to see the potential and his enthusiasm increased when Gurney confided that Ford Motor Company _ after an absence of several decades _ was considering an Indianapolis 500 entry and sought a team with which to partner. A marriage soon was made, and a team of three production-based V8 Ford-powered Lotus cars were entered in the 1963 Indianapolis 500 to be wheeled by Chapman’s top driver, Clark of Scotland, and by Gurney, who was on-loan from Brabham. Clark went on to finish second in the 500 in the No. 92 Lotus. Gurney, down on power and making a second stop while Clark only made one, salvaged seventh in the No. 93 car. Two years later, Clark drove the No. 82 Lotus Powered by Ford to the first rear-engine win in the Indianapolis 500, permanently ending the reign of the front-engine Roadster. at IMS. But Rahal added that his association with Gurney dates to 1960, when Dan joined the Road Racers Driving Club. Gurney remained an RRDC member for 57 years. “It is with the deepest sadness and regret that we have to say goodbye to one of the most magnificent people to have represented our sport on this earth,” Rahal said. “He was not only an outrageously talented race car driver, influential businessman, team-owner and car constructor, Daniel Sexton Gurney was a gentleman, in every definition of that word. His magnetic smile, his sense of humor and absolute love of all things motor racing is unsurpassed. In recent years, Gurney also enthusiastically embraced the role of ambassador for the Verizon IndyCar Series’ Toyota Grand Prix of Long Beach, America’s version of F1’s famed Monaco Grand Prix. “The employees and fans of the Toyota Grand Prix of Long Beach are truly saddened to hear of the passing of racing legend Dan Gurney,” said Jim Michaelian, president/CEO of the Grand Prix Association of Long Beach. “As well as being an icon in the world of motorsports, he was one of the founders of the Grand Prix Association of Long Beach and single-handily responsible for providing credibility in the effort to conduct the first modern street race in America in 1975. There are many wonderful stories involving Gurney, who on race morning in 1968, wore the first full-face helmet ever seen at Indianapolis Motor Speedway. He was an unabashed “stand-on-the-gas” type as a driver, who dropped out of many races while in commanding positions. Gurney once confided that some of his favorite races had been ones he hadn’t finished, chuckling that he would far rather blow up while leading than be restricted to a strategic and disciplined pace to try and win. Described by the Brits as “a bit of a lad” and prankster, Gurney experienced many serious moments during an era when racing safety was in its infancy and mortality rates high. Perhaps the most poignant Gurney anecdote took place at the funeral of Clark in April 1968, following his death in a crash during a Formula 2 race. At one point during the service, a gentleman asked Gurney if he could spend a few private moments with him away from the others. The gentleman then identified himself as Clark’s father. He went on to explain that the family had seen very little of Jimmy in recent months, after the crippling British tax laws had forced him into following in the footsteps of others in the sports world and show business by moving to the continent, typically to the south of France. The report is that Gurney began to cry, and decades later, tears typically would come to his eyes whenever Clark and his father were mentioned. Gurney is a member of just about every motorsports hall of fame in the world, and was presented the Spirit of Ford Award in 1999, the company’s highest racing honor. In addition to designing the closed-faced helmet, Gurney invented what became known as the “Gurney flap,” a small piece of metal attached to the rear wing of a car to increase downforce. And, oh yes, Dan Gurney was the first driver to spray champagne during a Victory Lane celebration, standing alongside a grinning “Super Tex” in Le Mans. Services will be private, per Gurney’s wishes. In lieu of flowers, donations can be made to the Hoag Hospital Foundation in Newport Beach, Calif. Condolences and sentiments can be sent to eagleracingcarsusa@aarinc.com.